On June 2, 1946 the Italians chose in a referendum to replace the monarchy established in 1861 with republican institutions. It is for this reason that each year that day is celebrated as Festa della Repubblica and is a public holiday. It is also the day chosen for a military parade to mark the loyalty of the military forces to the Republic, a not to be taken for granted loyalty because most of the highest ranks of the Army and of the Navy were in favour of the monarchy. Until the early 1970s the parade was very much an exhibition of military power, although limited by the scarce resource allocated to the Ministry of Defence, which in addition was mostly spent in maintaining a gigantic bureaucracy, rather than in modern equipment. The parade came under criticism as a waste of money and as a risk for the monuments of Ancient Rome, because of the vibrations caused by heavy tanks going through Arco di Costantino and next to Colosseo. The writer of this web site was among a small group of protesters who on June 2, 1972 were arrested for voicing their views against a show of military strength which was both excessive and dangerous. While at the time public opinion seemed totally in favour of the parade, in a matter of few years, things changed drastically and eventually in the frame of a cost reduction effort the parade was cancelled. In the 1990s the parade was resumed in an effort to strengthen national feelings vis-à-vis a growing request for a federal form of government. It was redesigned and it is no longer a show of military force and readiness, but a celebration of the recent history of Italy through the display of uniforms and equipment of the past. The parade takes place on Via dei Fori Imperiali, the large avenue opened in the 1930s between Colosseo and Palazzo Venezia, but it is possible to have a close look at the participants and at the equipment, by going near S. Gregorio al Celio where the parade starts. The soldiers are pretty glad to pose in their historical uniforms, as if they were movie stars. Maybe Ernest Hemingway drove this truck when he volunteered on the Italian front (1918). He described this experience in "A Farewell to Arms"
Foreign military attachés may find little to spy on in the equipment being displayed, as most of it is nearly a hundred years old. WWI saw the large use of new warfare tools: but those who believed they would have brought the war to a rapid conclusion were wrong: barbed wire and trenches stopped almost all attempts by both sides to break enemy lines. Many market stalls cater for an international clientele, not just for the community to which the owner belongs; in the image on the left a Bangladesh shopkeeper has in store bottles of Inka Cola, which is a soft drink with a flavour similar to bubblegum, or a banana cream soda, that is made in Peru. Tropical vegetables are sold together with those which are typical of Roman cooking. The official part of the parade begins at 9:30 and in June the weather can get pretty hot even in the early morning: this explains why those who have to wear a very heavy helmet wait the last minute to do it. The parade is preceded by a review of the troops: this occurs in Via di S. Gregorio, between Colosseo and S. Gregorio Magno. Notwithstanding a large number of security guards and in particular of plain cloth policemen, easily detectable owing to their "leftist" attire, the atmosphere is that of a relaxed popular event. The President of the Republic, Carlo Azeglio Ciampi (in 2005) reviewed the troops standing on a slow moving vintage Italian car. He was accompanied by the Chief Officer and by the Minister of Defence. The President of the Italian Republic is not involved in day-to day politics, he has mainly a representative role: so his appearance is greeted with applause. In the afternoon the President opens the gardens of Palazzo del Quirinale to the public. The military tradition of Italy is embedded in that of a tiny state, which developed around the year 1000 on both the Italian and the French side of the Alps: Savoy, at the beginning a county, then a dukedom and eventually (in 1713) a kingdom, when Duke Vittorio Amedeo II, by playing well his cards in the Spanish Succession War, managed to get Sicily and to become a king. In 1720 he had to exchange Sicily for Sardinia. The Kingdom of Sardinia, whose capital was Turin, eventually annexed in 1859/60: Lombardy (a former Austrian possession); the Dukedoms of Parma and Piacenza and of Modena and Reggio; the Granduchy of Tuscany; a large part of the Papal State; the Kingdom of the Two Sicilies (aka Kingdom of Naples). It is interesting to note that the armed forces of these states were not disbanded, but they were associated with those of the Kingdom of Sardinia. The Carabinieri were founded in 1814: they were part of the Army and therefore received war training, but in peace-time, rather than playing with manoeuvres and parades, they acted as a territorial police force. In this role they have gained a reputation for honesty and fairness. Because unfortunately in Italy being honest is regarded as being foolish, Carabinieri are the traditional subject of jokes. As most other armies, also the Italian Armed Forces have been greatly reduced in numbers and in 2005 the draft was abolished. There has been a major down sizing process and so most of the flags exhibited in the parade belong to no longer existing regiments. Also the flags of other countries who fought WWII on the Italian battlefield take part in the parade. "An extraordinary example of courage and geniality" with these words Winston Churchill described an action of the enemy. Dreadnought HMS Valiant was put out of action for six months by Italian human torpedoes or ‘chariots’ which penetrated the defences of Alexandria Harbour on December 18, 1941. On that day an Italian midget submarine released three slow moving torpedoes (which the Italians called maiali, hogs) outside Alexandria harbour: their objective was to damage the British Fleet to prevent attacks against the Italian convoys to Libya. The three torpedoes managed to get inside the harbour and to place explosive charges on the hull of three ships. The leader of the group, Durand de La Penne, and his assistant were spotted by sentries and captured. They were interrogated by Valiant's officers, but they answered only stating their rank and their number. Admiral Cunningham ordered them jailed on the Valiant well below the floating line, to understand from their reaction if the ship was in danger. A man of honour, de la Penne refused to tell his captors where he had placed the explosive charges, but with minutes to go before the timed detonation, he urged the battleship’s commanding officer to save as many of the ship’s company as possible. As men clambered towards the upper decks, the charge went off, ripping a 1,800 sq ft hole near the warship’s A turret. De la Penne’s expertise was subsequently put to good use by the Allies after the Italian surrender in September 1943, when midget submarines were called upon to attack the Italian port of La Spezia, by then in German hands. On one day of 1945 Durand de La Penne received the Gold Medal for Military Valour and it was pinned to his chest by Vice-admiral Charles Morgan, chief of Mediterranean Fleet and former Valiant's captain. 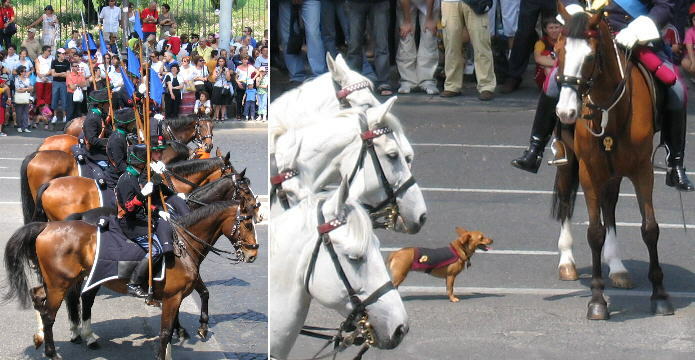 The parade is closed by chivalry regiments and bands in their old uniforms: the parade is a very slow moving event and it is hard to control the horses, although they are often given lumps of sugar. 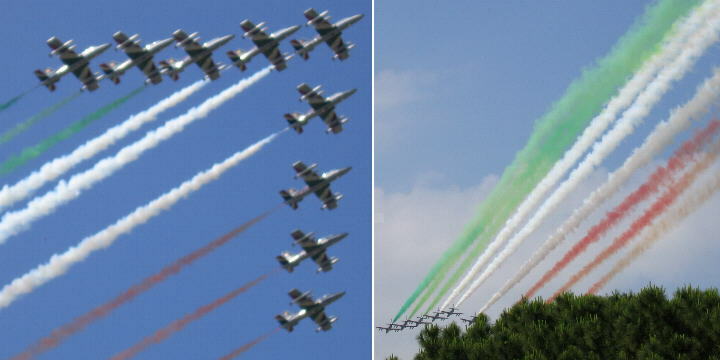 The name of the Italian acrobatic flight team Frecce Tricolori (three-coloured arrows) is self-explanatory. At the parade they do not engage in a show and the team lacks its soloist (the nine fighter jets are a sort of choir). Their passage marks the end of the official ceremony.